Camera movements like zooms can create visual interest in a video clip, as well as offer the narrative function of guiding the viewer’s eye to a focal point in an image. While working through an edit in Adobe Premiere Pro, you may find yourself with a video clip that could benefit from a zoom, but for one reason or another—perhaps you’re working with stock footage—it didn’t happen in-camera. But no worries! It’s simple to zoom in Adobe Premiere Pro, and no one—save for fellow Premiere Pro pros—will be the wiser. Note: Keep in mind that zooming in will result in some loss of quality in your footage. For best results, use high-resolution video for this effect. Select a clip in your Timeline and position the playhead where the movement will begin. Open the Effect Controls panel and locate the Scale and Position properties. Click the stopwatch to turn on keyframing and set a keyframe for both Scale and Position. The stopwatch will be blue when keyframing is on, and any further adjustments made to those properties will be recorded via keyframe. Move the playhead to the spot where you want the movement to end and adjust the Scale and Position properties so you’re zoomed in and framed up around your subject. New keyframes will be recorded as long as keyframing is on. Play it back in real time and make any adjustments. To make the movement quicker, move the keyframes closer together. To slow it down, move them farther apart. You might notice the move seems to start and stop abruptly. To create more of a non-linear motion, select your first keyframes and right click for a few options. Try Ease Out for the beginning of the movement, and Ease In for the end. To create a zoom out, just set your first keyframes at the beginning of the clip, and adjust the Scale and Position properties so the clip is zoomed in to start. Digital zooms in Adobe Premiere Pro can go beyond a simple zoom in and out. Level up with transition effects or create a visual drama with a digital dolly zoom. Duplicate your clip as many times as you want the effect to zoom in. Typically around three or four cuts will do the trick. Duplicate the clip by option-dragging (alt on a PC) the clip straight up in the Timeline. Use the Scale property in the Effect Controls panel to scale up each clip a little bit more than the last. You can hide tracks with the eyeball icon while you work. In the Effects panel, find the Transform effect and drag it to the first clip. In the Effect Controls Panel, uncheck “use composition shutter angle” and set it to 180. This will create motion blur when you animate. Note: You can use the Transform effect in lieu of the Motion adjustment to create motion blur in a standard zoom as well. Using the Position property under the Transform effect (not Motion), toggle animation (the stopwatch!) to set your first keyframe. Move the playhead forward 4 or so frames and adjust the Position property so the clip is up and out of the frame. Trim the excess footage from the end of the clip. Copy and Paste the Transform effect to the next track. Select the two keyframes—in either the Effect Controls tab or the Timeline—and drag them into position right after the first animation. Repeat with the remaining tracks. Tip: Keyframes for the selected clip will always display in the Effect Controls panel. To view them in the Timeline as well, use the Timeline handles to view tracks larger. Right-click the fx icon and select the keyframed property you want to view. Watch it back in real time and make any adjustments. Add in camera shutter sound effects, and you’re basically as good as those pros who edit Scandal. Start with two clips in the timeline. Right-click in your Project panel and choose New > Adjustment Layer and drag it to your Timeline. Resize the adjustment layer so it overlaps both clips you’re transitioning between. Duplicate the adjustment layer to the track above. Resize the bottom adjustment layer so it begins with the second video clip, and ends with the top adjustment layer. Add the Transform effect to the top adjustment layer and keyframe a zoom that scales from 0 to 300. Add motion blur by unchecking “use composition shutter angle” and setting it to 180. If you play it back, it will look a bit wacky, but hang in there! Hide the top adjustment layer. Open the Effects panel and find the Replicate effect, and add it to the bottom adjustment layer. In the Effect Controls panel, set the effect to 3. This next part is the trickiest. You’ll need to reflect the center image 4 times. Think of it as reflecting over the four lines that make up the grid below. For the first reflection, set the Reflection Angle to 90 degrees and adjust the Y parameter until the line disappears between the middle and bottom rows of your grid. For the second reflection, set the Reflection Angle to -90 degrees and adjust the Y parameter until the line between the top and middle rows disappears. Remember: you’re just reflecting over one line at a time. For the third reflection, set the Reflection Angle to 180 degrees and adjust the X parameter until the line between the left and center columns disappears. For the fourth reflection, set the Reflection Angle to 360 degrees and adjust the X parameter until the line between the center and right column disappears. There should be no harsh lines in your grid. Un-hide your Scale adjustment later and play it back. Make adjustments as needed. In-camera, a Dolly Zoom effect is created by dollying the camera forward or backward, and simultaneously zooming the camera lens in the opposite direction. The result is a disorienting effect where the background appears to be scaling around the stationary subject. One popular example is in the movie, Jaws. To create this effect in-camera, you do need several people and pieces of equipment, but Premiere Pro can get you pretty darn close to the real thing. The trick to this effect is selecting an appropriate clip to start with. The camera must physically move forward or backward in the space. This could be a dolly movement or drone movement, but not an in-camera zoom. This effect also works best when your clip has a clear subject, though this is not necessary. This part is easy because you already know how to create a basic digital zoom—and that’s all it is! Align your keyframes with the start and end of the dolly movement. This may take a few tries to get the scale right. Remember: the goal is to keep your subject the same size for the duration of the clip. And that’s a wrap! 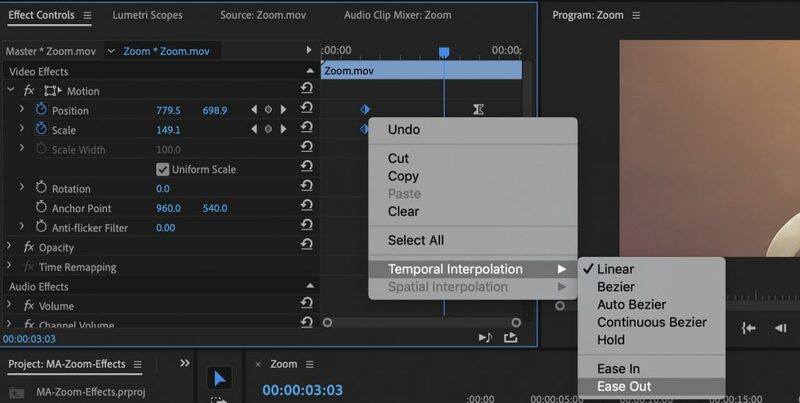 Whether you need a slight adjustment to offer narrative function in your short film, or an effect to add flair to your YouTube channel, an Adobe Premiere zoom has got you covered. Once you know how to zoom in Premiere Pro, it’s a breeze to customize the effect to work for any project in post-production.